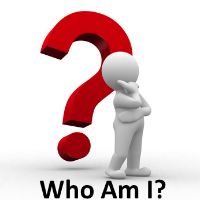 User Attributes – Part of Identity? I recently participated in an Identity and Access Management architecture session where I was asked a direct question, “Do you consider user attributes not stored in the main directory a part of user Identity?” When I said yes, a few people seemed somewhat perplexed. Please let me explain my point of view. I think there is a propensity to think that “Identity attributes” are strictly limited to those stored in a directory user object. That focus is too narrow. While it may be that the “Identity Management System” only knows about those attributes, the sum total of real Identity information can be much broader. This broader view of Identity is essential if we hope to leverage Identity Management to enable innovative business models. For example, if I am an online vendor hoping to leverage user Identities to provide a highly personalized user experience for my customers, I must not rely only on the user object in the authentication directory. A more rich set of Identity data comprising history, preferences and real-time context must be considered. This information may reside in multiple repositories. Just my thoughts. What do you think? A major Identity and Access Management problem is having only a partial view of Identity information that doesn’t give you the complete picture. Correlating identity data can be difficult, because the data resides in multiple identity data silos. The solution is to collect, compile and correlate identity into an Identity Warehouse. Many applications can access and leverage the the Identity Warehouse, including role governance, change management, IT Audit Policy Monitoring, risk assessment, configuration analysis and access certification. A business glossary, which assign business terms to cryptic technical terms, helps an Identity Warehouse deliver real business value. The Identity Warehouse and related applications help an organization go beyond compliance and build trust in the organization. The Identity Warehouse can provide a complete view of your environment today. 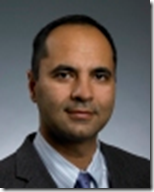 Oracle’s solution to tackle these issues is Oracle Identity Analytics. I like the term “Identity Intelligence.” Using analytical methods to extract intelligence from massive amounts of identity data is a smart thing to do. Well said. That’s what Amit’s talk was all about. 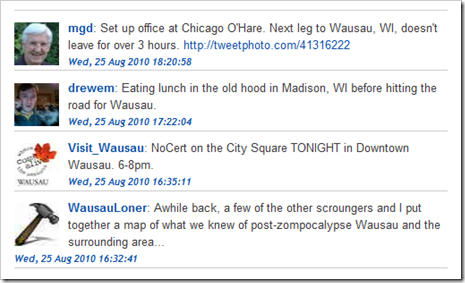 Note: This little post chronicles my favorite social media exchange in a long time. You need to see the embedded images to get the gist of an intriguing conversation. 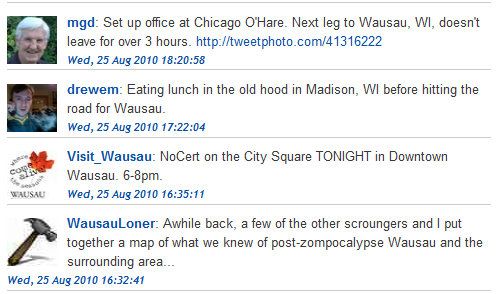 … along with my new follower, the Zombie Apocalypse expert, Wausau Loner. I posed the big question: Do zombies have unique Identities? Do they need Identity Management? Well, there are still many unanswered questions. 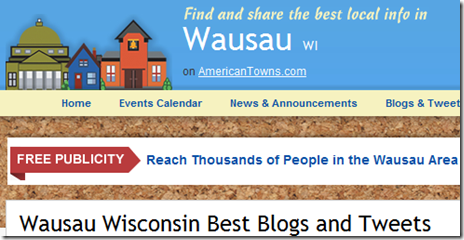 May be next time I visit Wausau, I’ll get together with Wausau Loner and get more details! I’ll let you know. Want to Steal $11 million? Use Orphan Accounts. I first met Alan Norquist back in 2000 while we worked together at Ponte Communications, a dot-com startup that lured me away from my first stint at Oracle. Ironically, Alan came to Ponte directly from Sun Microsystems; I would later join Sun. At Ponte, we developed and sold technology to provision and configure a wide range of network infrastructure devices. The company didn’t succeed, but it allowed me to focus for awhile on the issues involved in using a centralized application to provision multiple connected devices – a capability that was central to the growth of Identity Management Provisioning market a few years later. In the ensuing ten years, Alan has been a successful serial entrepreneur. He is now Founder and CEO at another emerging company, Veriphyr, which uses advanced data analytics to automatically discover user access policy exceptions. Again, our lives have converged because of common professional focus on Identity Management and Information Security. Michelle Cawthra, who was a supervisor at the Colorado Department of Revenue, had testified that during the scheme, she deposited unclaimed tax refunds and other money in [her boyfriend’s] bank accounts by forging documents and creating fake businesses. How did she do it? Rather than de-provisioning access for a few employees who had reported to her, she allowed the orphan accounts to hang around. Ms. Cawthra had convinced the departing employees to share their passwords with her, so she had multiple unfettered channels of access to complete her nefarious schemes. Interestingly enough, preventative Separation of Duties (SOD) controls were in place. But with appropriate orphan accounts within her grasp, Ms. Cawthra was able to circumvent those controls and complete her work. In addition to preventative controls, a method to detect illicit use before the case got out of hand was really needed. So if you want to steal $11 million, perhaps you can leverage orphan accounts. However, if you are on the right side of the law, I’m sure Alan would be delighted to discuss how Veriphyr can help catch schemes like Ms. Cawthra devised. There are so many things wrong here. Why weren’t controls in place to prevent, or at least raise a flag, when an agent accessed files randomly? Were they at least audited? Why did it take four years for someone to realize that there were shady dealings going on? How did CRA determine the "risk of injury"? Why aren’t the affected parties notified whenever there’s a breach? Open government requires a way for citizens to easily and safely engage with government websites. Open identity technologies—specifically OpenID and Information Cards—fit this bill. They make it easier and safer for citizens to register, login, and when necessary share personally identifiable information across different websites and services. To bring open identity technologies and open government together, the OpenID Foundation and the Information Card Foundation are working with the U.S. General Services Administration to create open trust frameworks for their respective communities. Presentation by Gerry Gebel of Axiomatics at Kantara workshop. 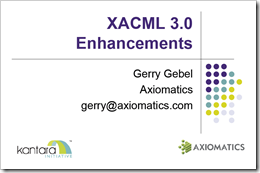 Includes good overview of XACML and coverage of v3.0 enhancements. 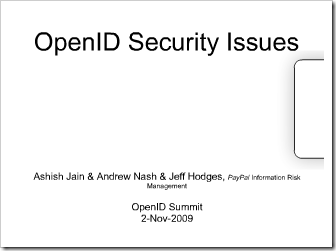 Presentation by Ashish Jain, Andrew Nash and Jeff Hodges of PayPal Information Risk Management at OpenID Summit, 2 November 2009. … defines and promotes an Identity Ecosystem that supports trusted online environments. The Identity Ecosystem is an online environment where individuals, organizations, services, and devices can trust each other because authoritative sources establish and authenticate their digital identities. The Strategy Document doesn’t discuss any specific technologies, but rather, addresses the needs and general concepts required for a national Identity Ecosystem. If you would like to make public comments on the strategy, a good place to visit is this IdeaScale page hosted by the Department of Homeland Security. Reading comments from other parties on that page is quite interesting. The Obama administration is proposing a new identity management system for the Internet which is calls “Identity Ecosystem.” This new system will replace individually managed usernames and passwords with a taxpayer-funded federally-managed system. The scheme is outlined in the National Strategy for Trusted Identities in Cyberspace. The planned system will tie together all of your accounts into one national online identity. This will enable the federal government to easily track all online activity of every American. The system will start with the federal government requiring the ID’s for use in accessing federal web sites — such as for filing your taxes online. The federal government will then force businesses to adopt the system, starting with banks and credit card companies and slowly spreading to encompass the entire online environment. Once fully implemented, Internet users will no longer be able to comment anonymously on blogs or web forums, because all online identities will be verified with the U.S. government. Where do you stand? I personally like the idea of public dialog on this issue and the call for public and private entities to participate in a solution. I look forward to giving feedback and tracking progress. “… introduce a new and revolutionary approach in application security – Oracle Identity Management 11g. “Modern enterprise architectures are evolving rapidly, yet many security solutions in use today represent decade old technology. Businesses must adapt swiftly to stay competitive, yet bolted-on security controls impede IT agility. Compliance mandates continue to grow in number, while organizations continue to struggle with their staggering costs and complexity. I’m looking forward to this event. We hope you can join us, too. You can register by clicking here. Thank you for visiting Discovering Identity and joining me in exploring the exciting world of Identity and Access Management. Copyright © 2005-2016, Mark G. Dixon. All Rights Reserved.